Brandon and I have been talking this weekend about how glad we are that we moved to Louisville (nearly two years ago–I can hardly believe that!). 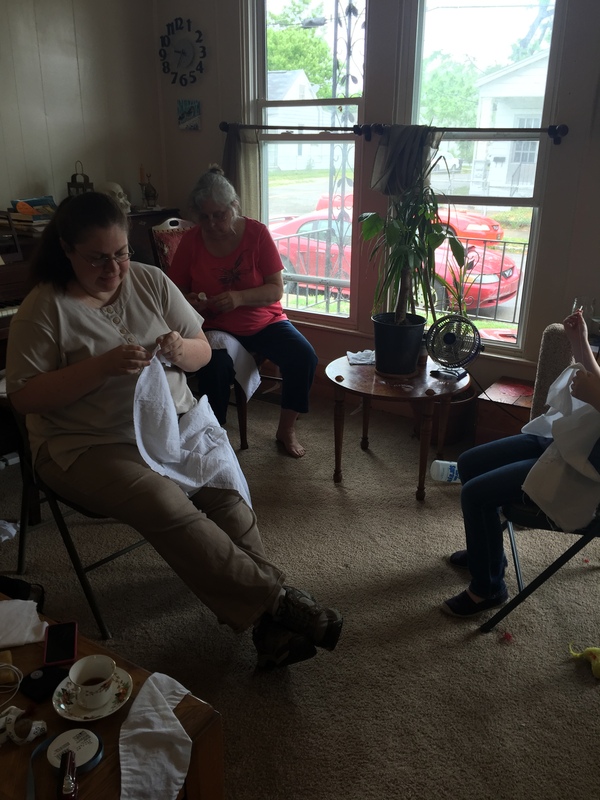 Since we got down here, we’ve found a wonderful circle of friends, we both have jobs we enjoy, and we’ve discovered a hobby that takes up much of our free time. 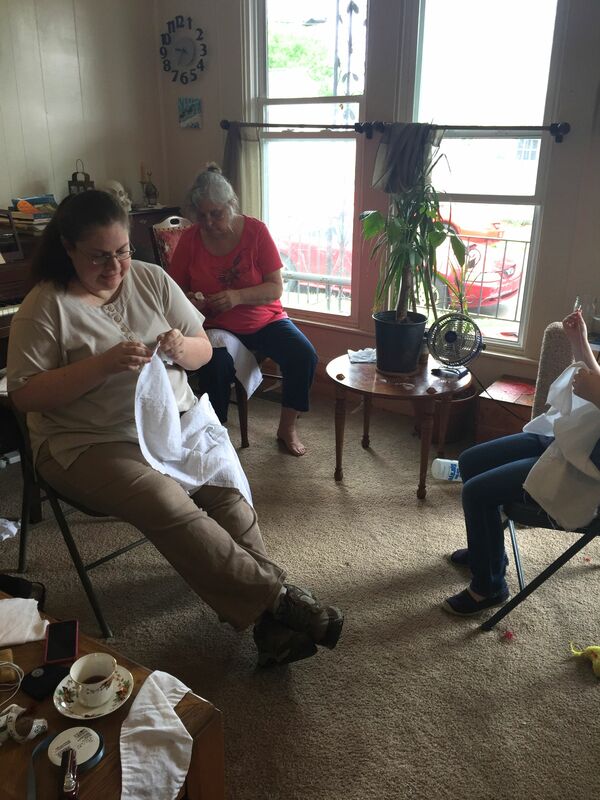 The friends and the hobby really go together a lot of the time, as was shown last Saturday, when the ladies of Locust Grove’s costumed interpreter corps (and a few others besides) rallied at my house for a tea party/day of stitching on Ann Croghan’s wedding dress. I couldn’t have done this without them. 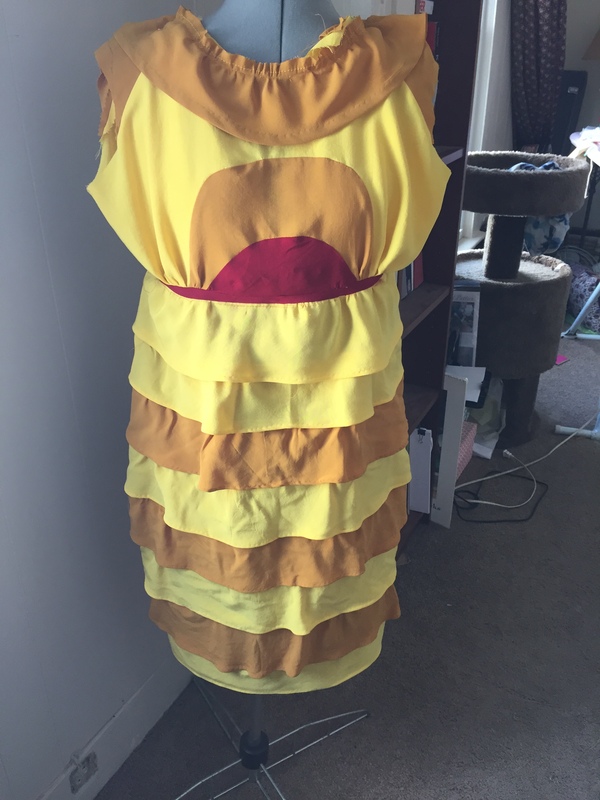 The dress is still a work in progress, but I can’t believe how much we’ve gotten done. 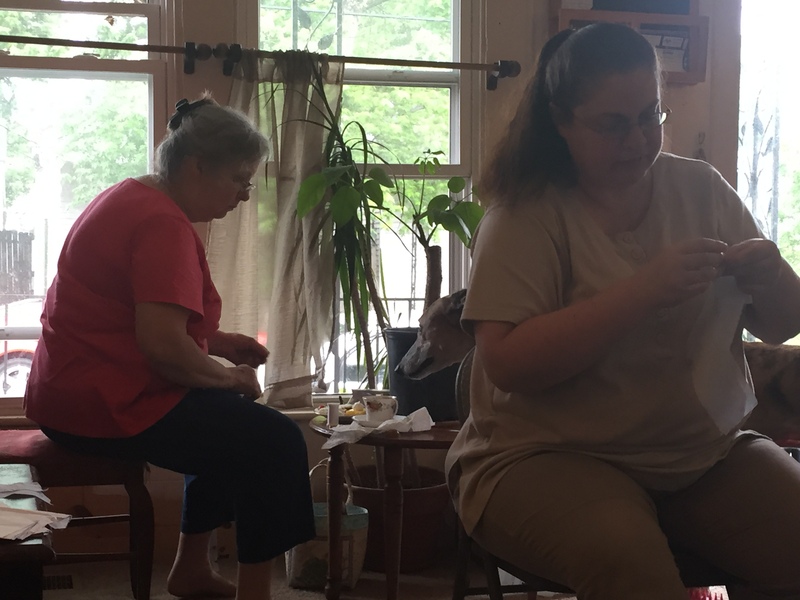 I spent last Friday night and Saturday morning preparing snacks and making sure everything was ready to be sewn, then threw my doors open to all and sundry. 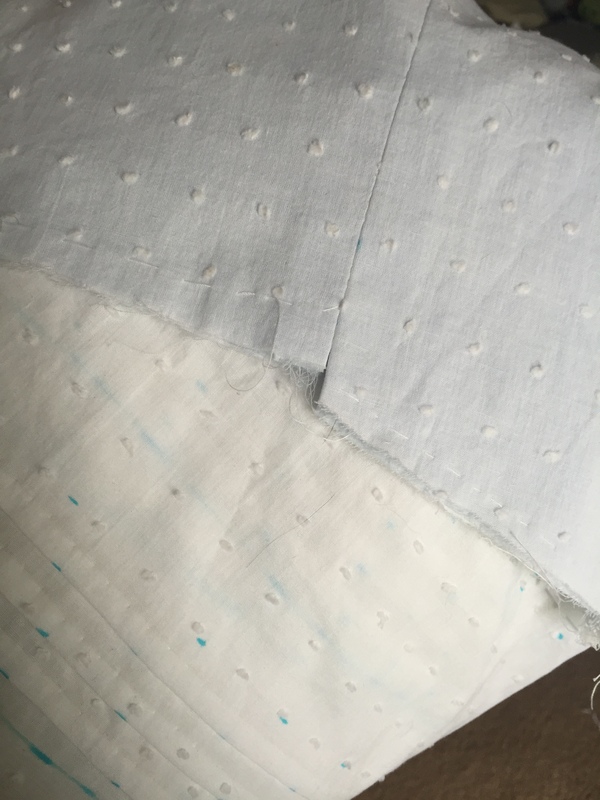 This including cutting each piece of the dress out of both white Swiss and light blue lawn. 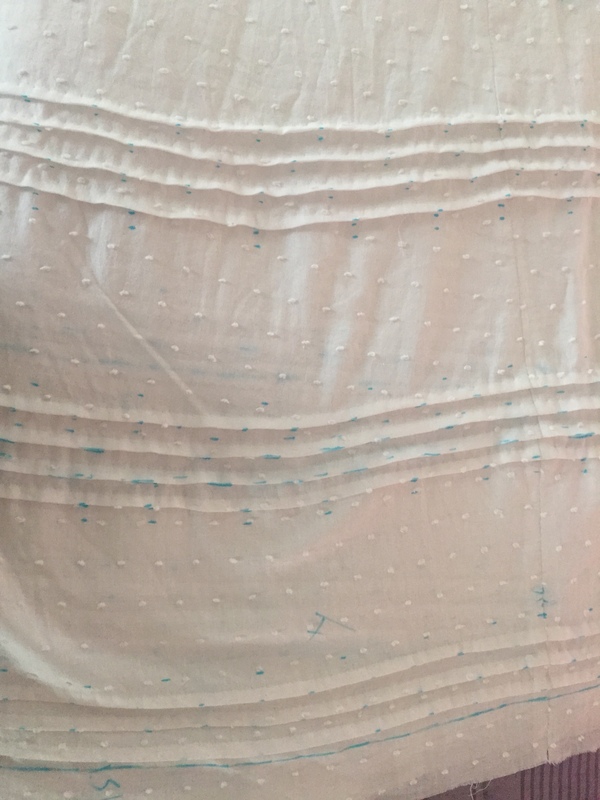 In the finished dress, the Swiss will be layered over the lawn so that just the barest blush of blue shows through. Amy spent most of the day working on this, and it’s so stunning. I should have kept track of how much time she spent carefully arranging those gathers so that they fell perfectly (the white piece of the front had to gather down onto a blue piece that was cut to the actual pattern specs). 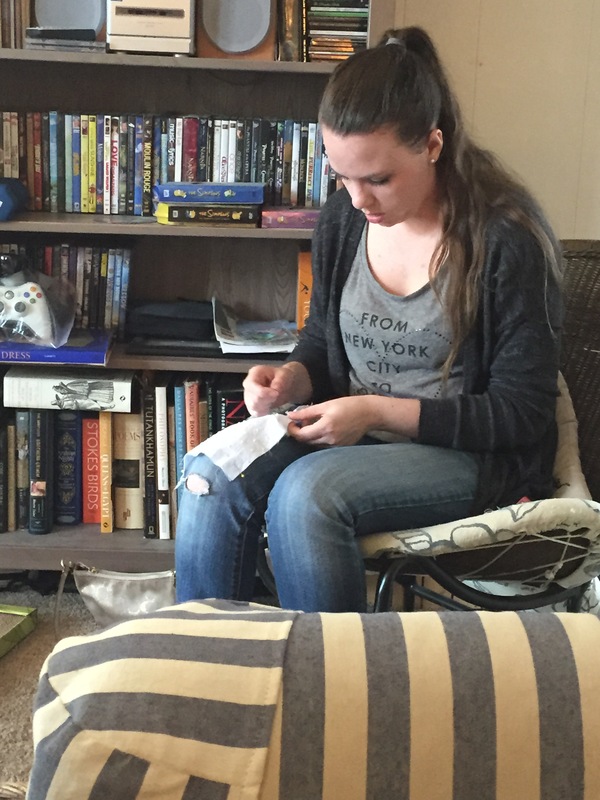 Photo Credit on this one to Amy Liebert! Jos and I also got to chat about books, which was awesome. One of the things I miss most about working at a bookstore is getting to talk about books with awesome kids like her! 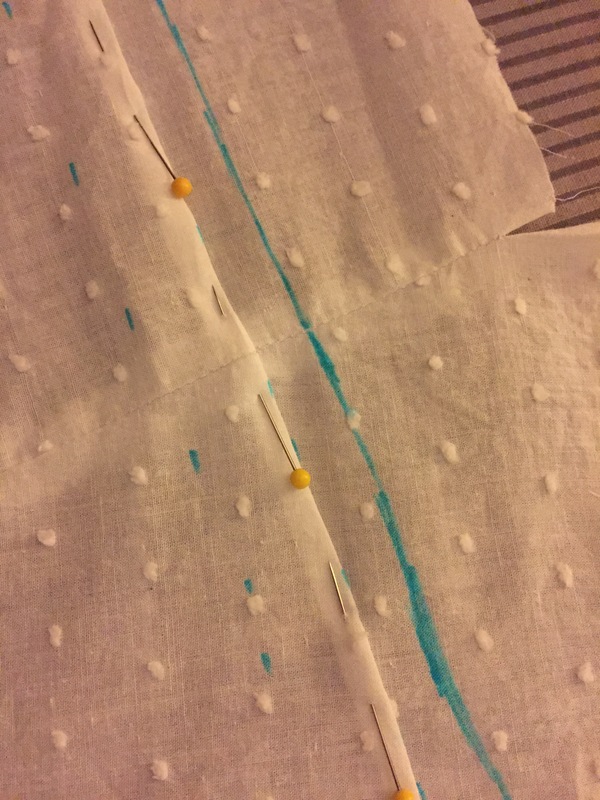 Don’t forget, boys and girls, always press your seams as you go! 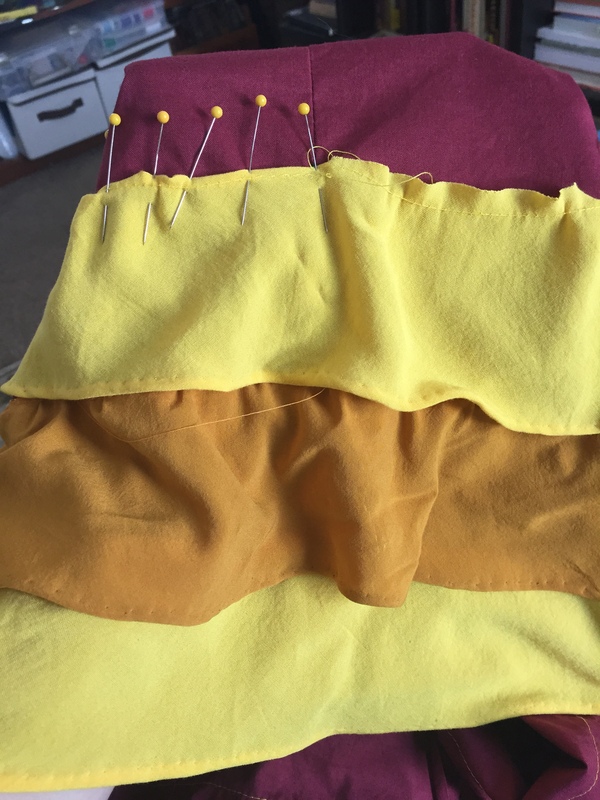 Lest you think I spent the whole day telling minions what to do while eating bonbons, here’s my project for the day (and beyond)–miles and miles of hand-sewn tucks on the skirt. Ok, so it’s not really miles, but it is over 100 feet total. I still have the last group of four to do before I’m done and get to start stitching the poofs into those empty spaces between them! Basically, what I’m saying is that I have some awesome people in my life. 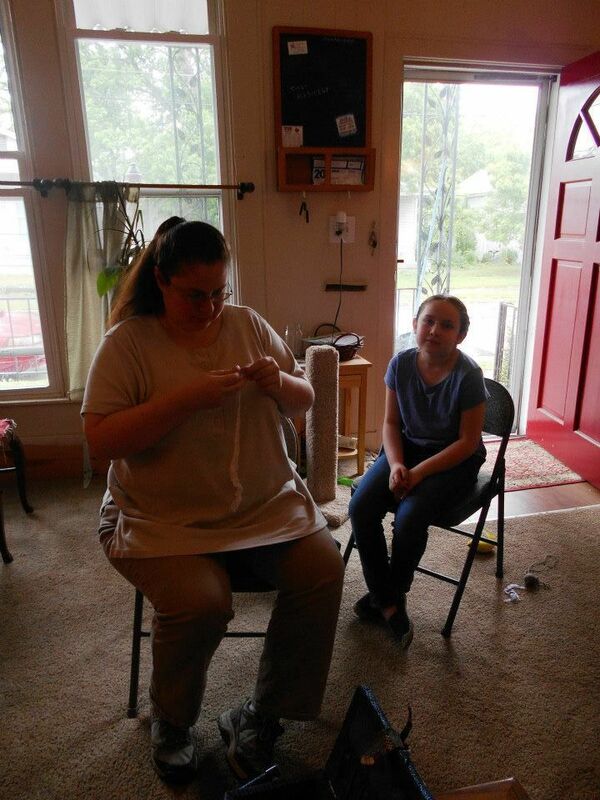 I had so much fun on Saturday, and I’m inexpressibly grateful to everybody who came and helped! I can’t even describe the tortured mental state that I would have been in without them. I can’t wait to see the finished product! 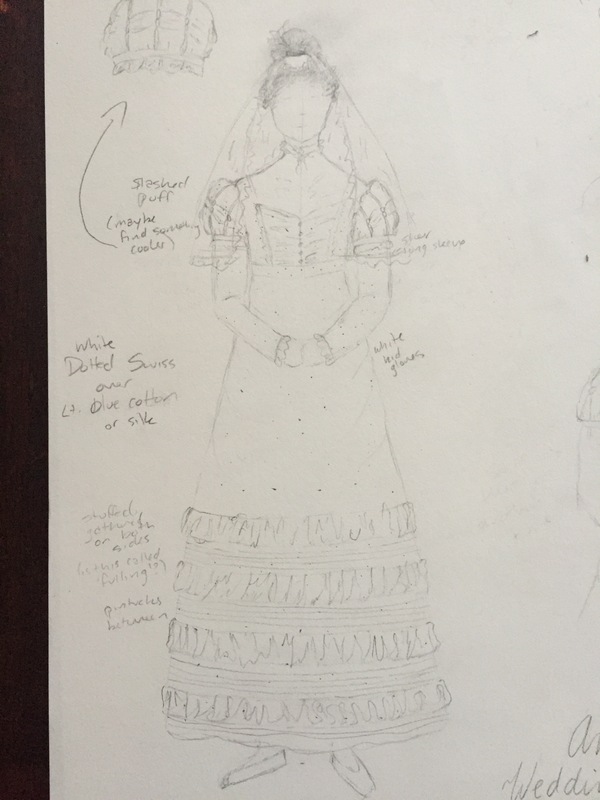 Read about the beginning of this project, and the research that goes into creating a period costume in The Wedding of Miss Croghan, Part 1. 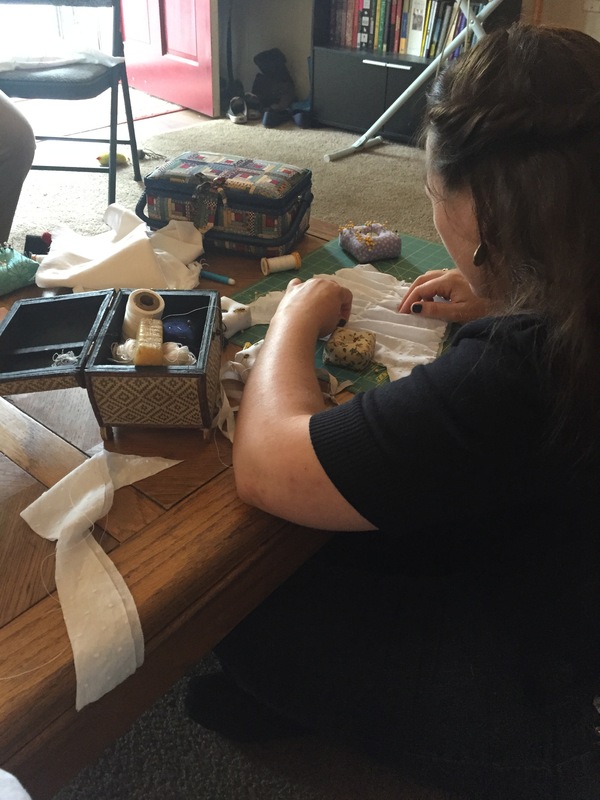 Or continue on to The Wedding of Miss Croghan, Part 3! Sometimes you get to be part of a project so incredible that it just takes multiple blog posts to do it justice. The Costumed Interpreter corps at Locust Grove is growing and growing, and this year we’re trying out something new. At the Historic Timeline Picnic each July, we will be presenting a reenactment outside of our normal 1816 scope–something really interesting that happened at Locust Grove that we wouldn’t usually get to show people. For the first year, we settled on Ann Croghan’s wedding to Thomas Jesup in 1822. 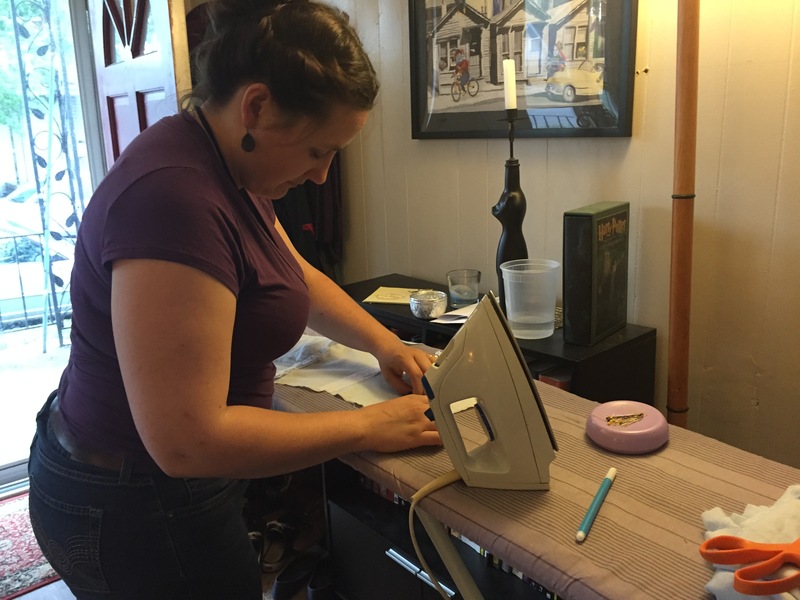 Working outside of 1816 presents plenty of challenges, first and foremost, that people playing central roles need new clothing for the new time period, and have to be willing to spend time and money on an outfit that they may not get another chance to wear. I was asked to play Ann back in January, and, being me, jumped at the chance to create a dress in a not-often-done period. And after several months of searching for a willing Jesup, guess who’s pretending to marry me in July? Brandon. Several people have threatened to become ordained ministers in order to turn our fake wedding into a real one in a romantic-comedy-like switch. But back to the dress. Wedding dresses in the early nineteenth century weren’t the bedazzled evening gowns we often think of today, but they were special. White, while a common color, was not compulsory. I spent the first few months after being cast doing research and planning what I wanted my outfit to look like. One of the most noticeable differences between 1816 and 1822 are the waistlines–in 1816, the empire waist had reached its highest point, which dropped rapidly over the next five years until it settled about halfway between the natural waist and the underbust. Skirts became more bell-shaped, and sleeves and hem decoration continued to grow. This is the transitional aesthetic between the Regency period and the Romantic. I looked at all sorts of dresses, but kept my biggest influences to actual wedding dresses and wedding fashion plates. 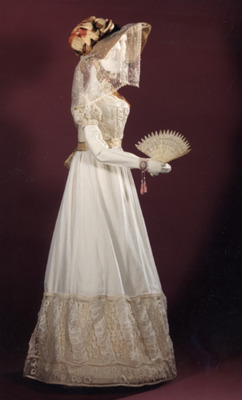 The wedding dress of Mrs. Peder Hjort, 1822, Denmark. This dress was my single biggest influence, I took the hem decoration and bodice front directly from it. I did want to tweak the shape a bit, though, to really highlight the differences between strictly Regency fashion, and this transitional period. 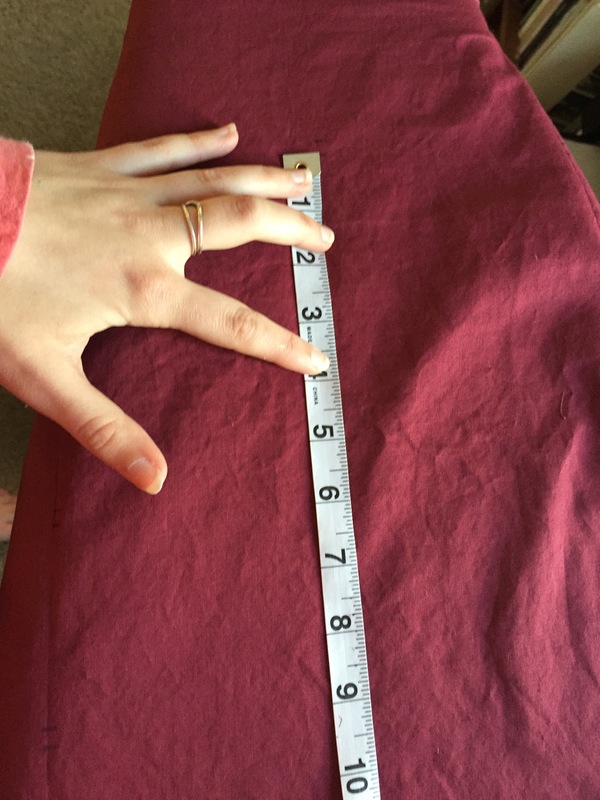 I added a waistband to emphasize the lower waistline, and widened the hem to be more bell-like. 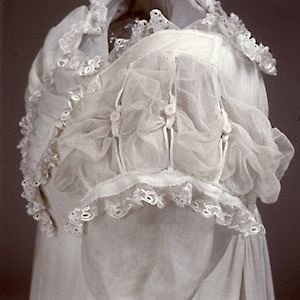 It’s very likely that the dress above would have a better shape if it had been displayed with a petticoat or two underneath, which Mrs. Hjort would have worn. This 1822 dress from the Musées Royeaux des Art et Histoire shows the shape I’m hoping to achieve. The only other thing about Mrs. Hjort’s wedding dress that I wanted to change was those sleeves. I mean come on. I like some froof, but those were a bit much. I used the sleeve cap detail, but made the design more streamlined by adding plain long sleeves underneath. To get the idea of what a full wedding ensemble might have looked like, I turned to fashion plates. These two from the Journals des Dames et des Modes were very helpful, the first is from 1820, the second from 1823. I would not normally use any resource from after 1822, but you can see that the basic ensemble doesn’t change much. I wish I could have found a wedding plate from 1822, but no luck there. These two plates are a great illustration of how quickly the hems were widening and waistlines dropping, because the two outfits are very similar except those minor changes in shape. The only other major difference is that the 1823 fashion called for long sleeves, and the 1820 for short. 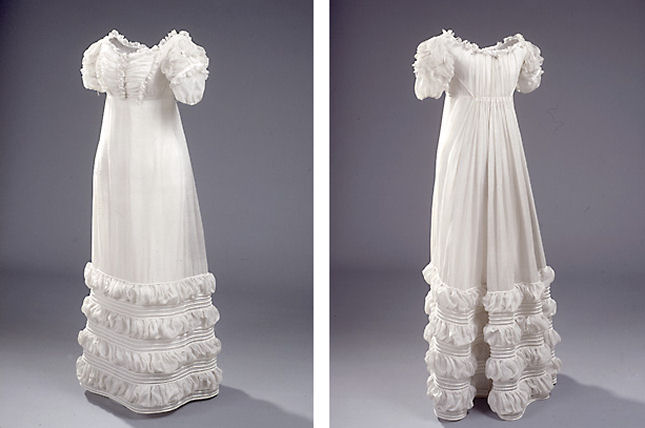 I wish I knew which was most fashionable in 1822, but I have seen extant examples with both. 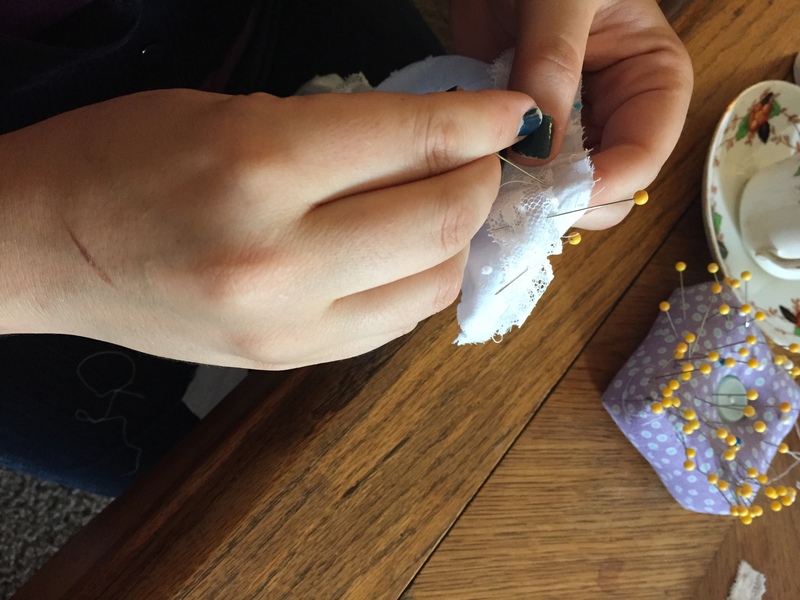 These plates were a bit of a sigh of relief, because they show that veils styled around elaborate hairstyles were the fashion which means I don’t have to build a new bonnet for the event! So once I had all this research done, it was time to put it all together, and I came up with this sketch. I know it’s a bit hard to see, but you can get the basic idea. 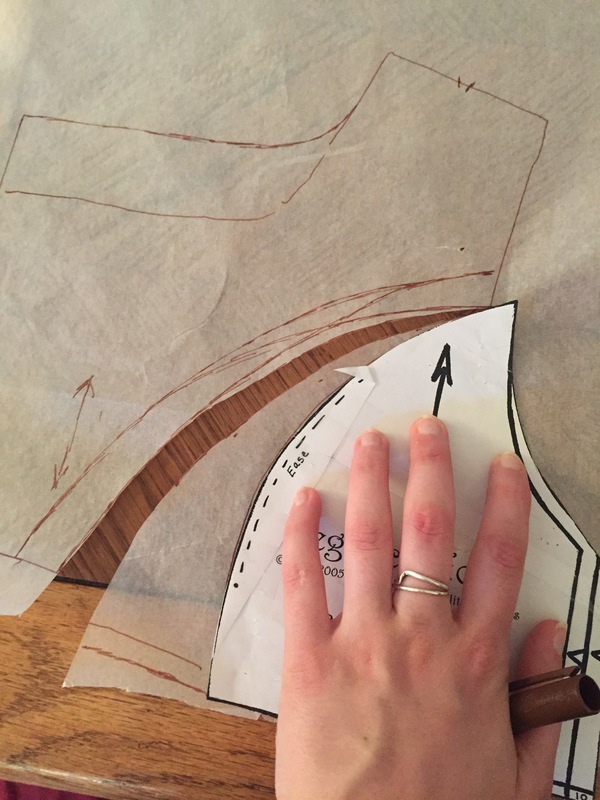 To turn this vision into a reality, I started with my Sensibility Regency Dress Pattern (as I so often do), and then changed everything about it. 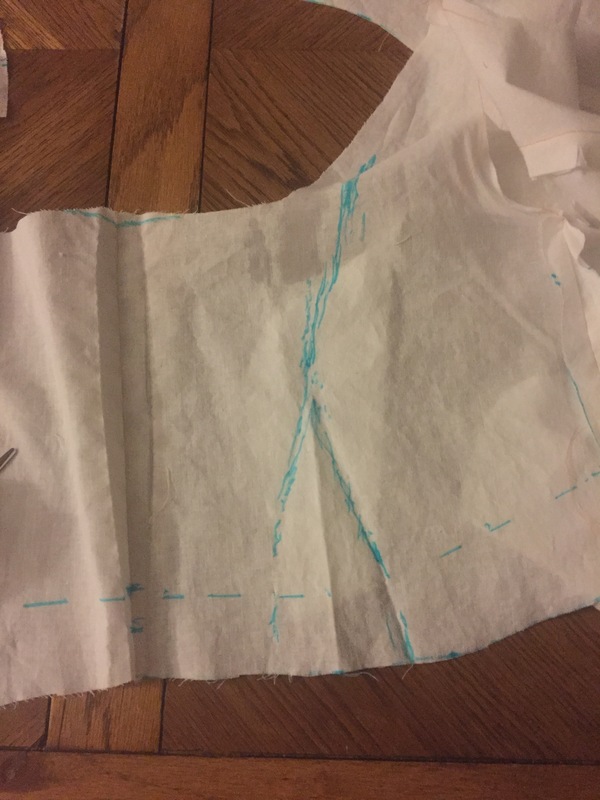 I find that it’s easier to start with a jumping off pattern, even if almost nothing about the dress will remain the same. At least I know that pattern fits me. 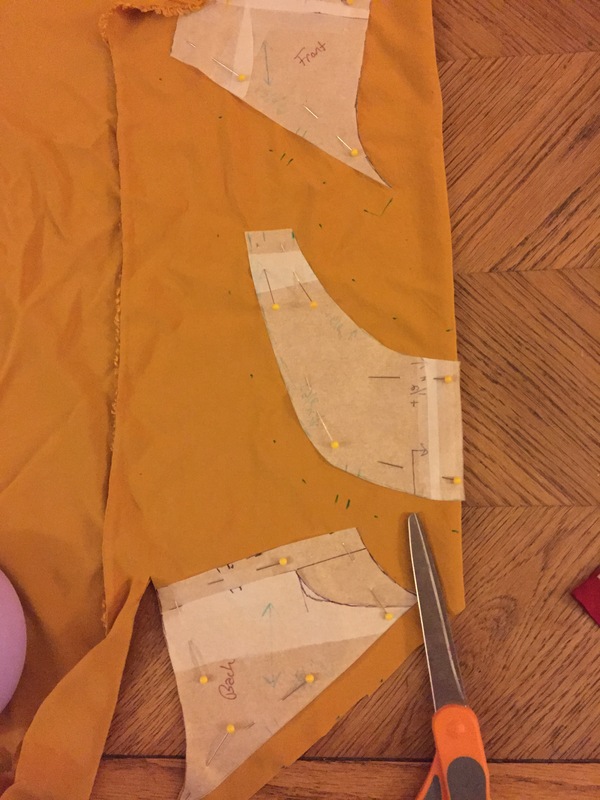 Dropping the waistline was no big deal, I just needed to lengthen each piece following the shape of my body. The biggest alteration was in the bodice front. 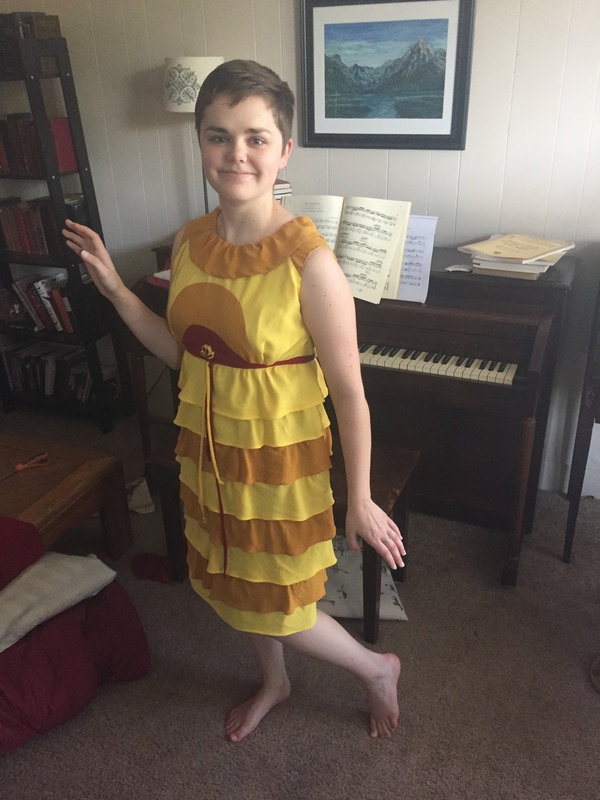 I had to turn the single-piece front that gathers into the waist into a three-piece front in order to create that lovely ruched and ruffled detail in the center. 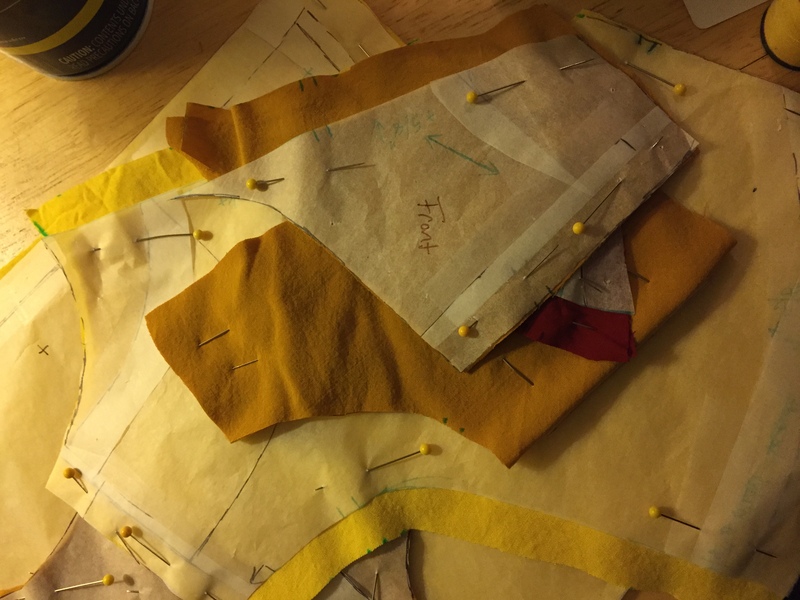 This involved making a mockup of the longer bodice, then putting it on, pinning and marking where the new seam would go, and removing the extra fabric that would have been gathered in. 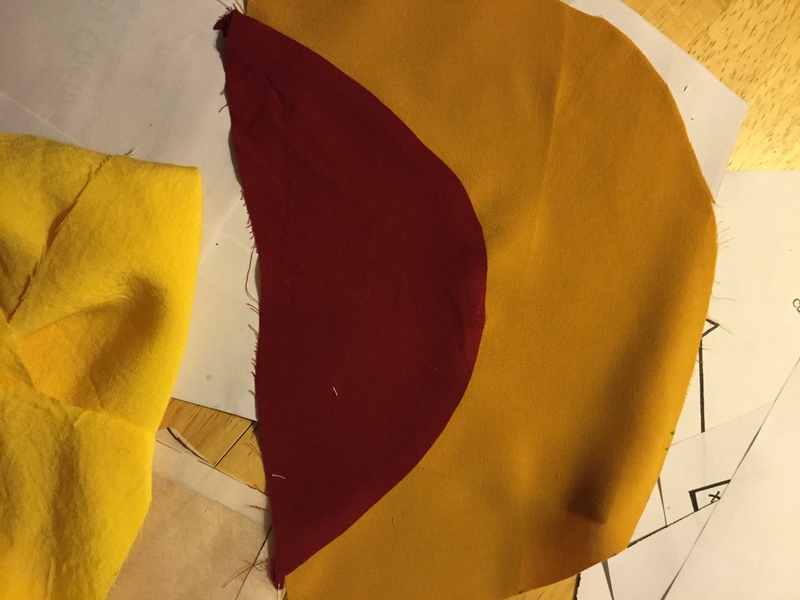 This picture shows what the shapes of the new pattern pieces would be. The back also needed some tweaking. I wanted a flat back, not a gathered one like in Mrs. Hjort’s dress at the beginning of this post. 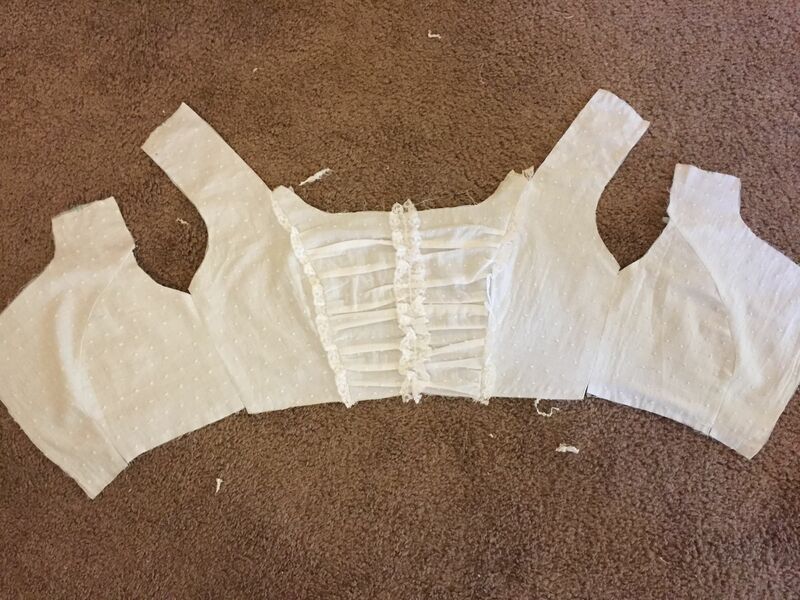 I was able to look at pictures of the backs of several 1822 gowns and spencers, and the center back pieces were much narrower at the bottom than my pattern was, creating almost a V-shape from shoulder to center-back. 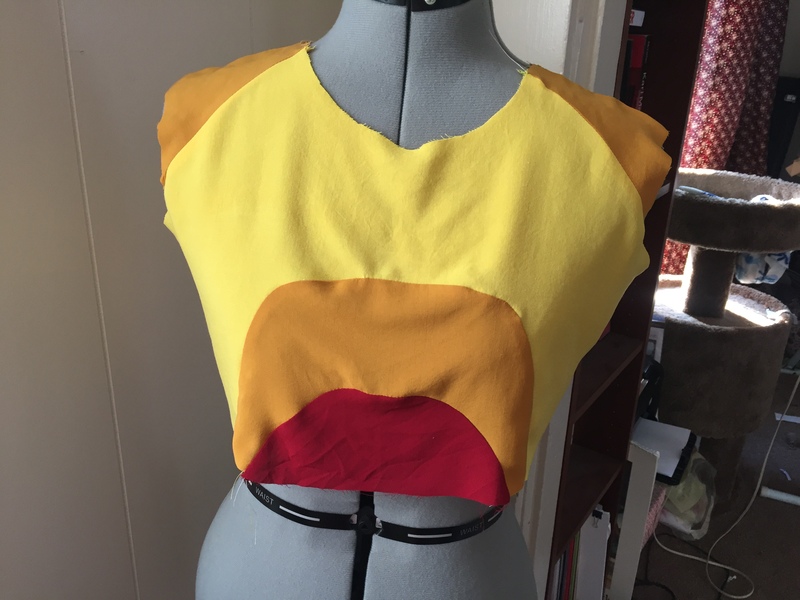 I had to adjust the shapes of the back and side-back pieces in order to achieve this look, then make a new mockup to check the fit of all my new pattern pieces. Poor Brandon got to pin me in and help adjust the fit where I couldn’t reach, but I think he’s gotten over the trauma (I can be a bit particular about my sewing…). I didn’t take pictures of the skirt adjustments because frankly, adding extra width to a hem is not terribly exciting. 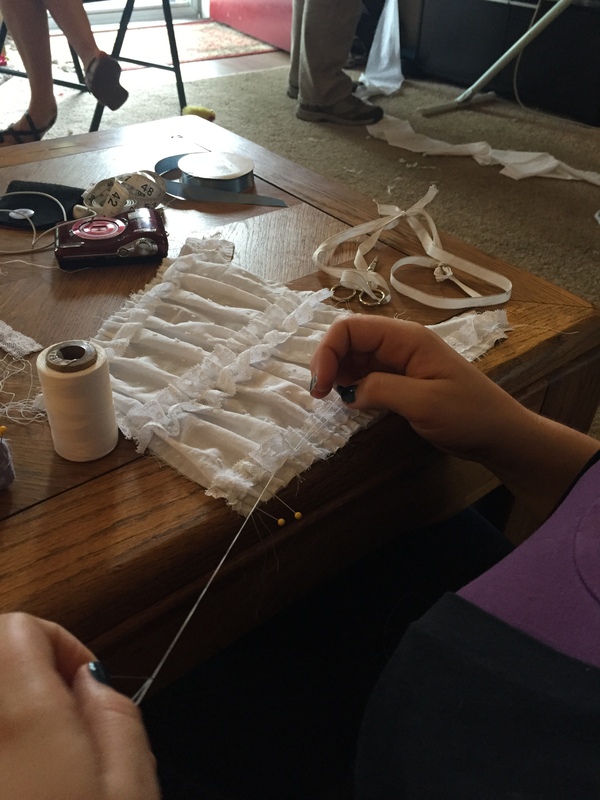 Construction on the dress has now begun, and more posts will follow soon! (Did I mention it’s all being done by hand?) Time to dive in to glorious period detail and hours and hours worth of pin-tucks. P.S. Here’s a sneak peek of what’s to come–I have amazing friends! You can read part two here. I got to take a break from historical for the past week and a half because I have the coolest job ever. We at Custom Wig Company are working hard (and succeeding!) at expanding our cosplay market, which is thrilling, because it makes my job even cooler to be able to create pieces based on some of my favorite characters. Our cosplay roster has really exploded this year as we slowly prove to people that yes, our pieces really are worth the money. Why spend all that time and effort crafting an exquisite costume just to cheapen the look by topping it off with a clunky plastic wig that doesn’t fit? 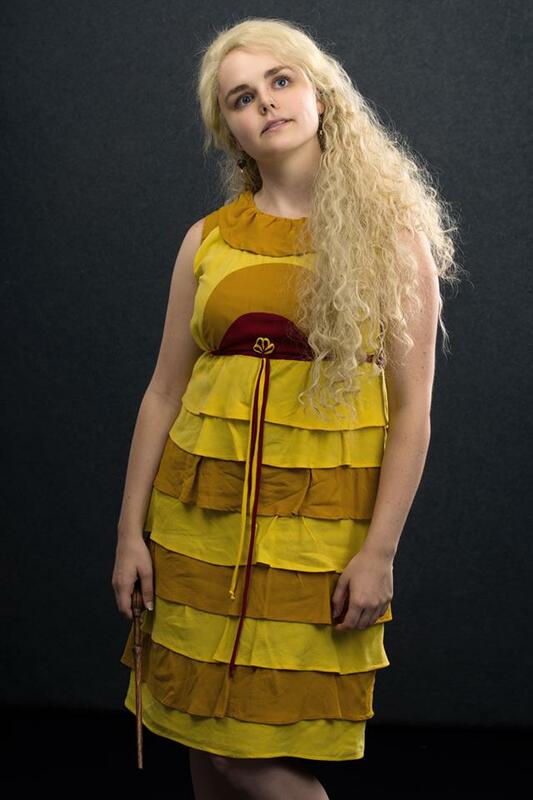 This is the dress Luna wears to Bill and Fleur’s wedding, because Xenophilius thinks you should wear sun colors to a wedding. 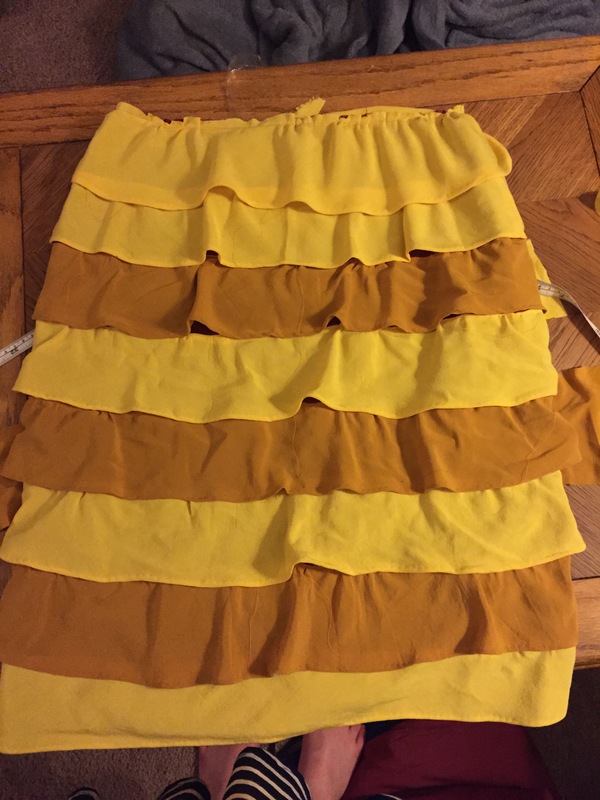 I landed on this one because 1) It won’t be as hot as some of her other costumes, 2) It involved one piece that I could make, instead of a bunch of pieces that I might have to try and find, and 3) I love yellow. 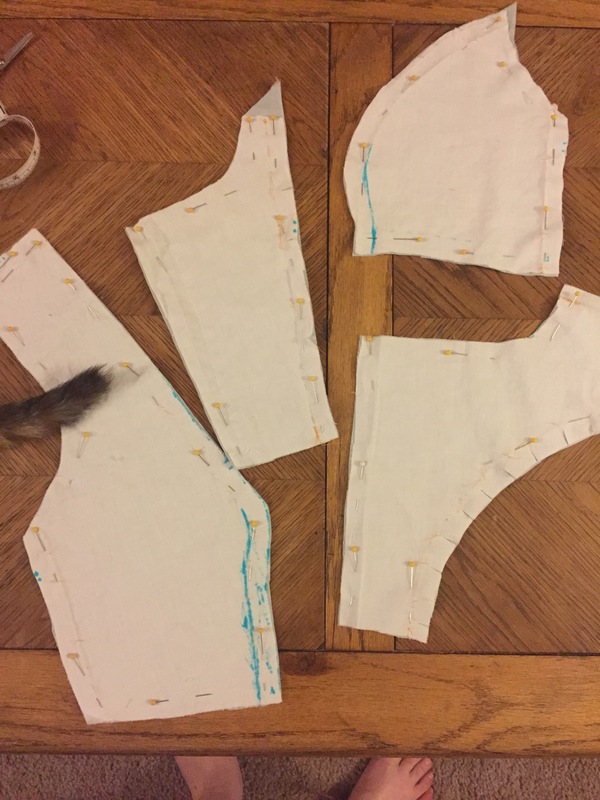 I adapted the bodice pattern from the one for my Regency dress (that thing sure comes in handy) after spending thirty seconds looking for a modern Empire dress pattern that I liked (there were none that came even close). I had to bring up the neckline, and drop the waist and move things around a bit to make up for the fact that I’ll be wearing a bra, not stays. 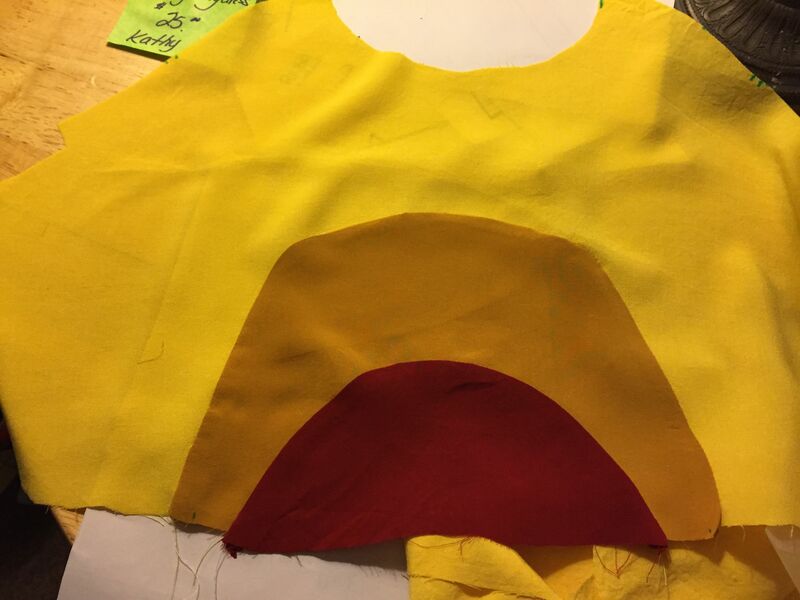 Once I had the mockup/lining the way I wanted it, I had to go through the terrifying ordeal of cutting the pattern up into pieces to make the colorblocked sun on the front of the dress. I double checked so many times to make sure I’d added seam allowance in all the right places. 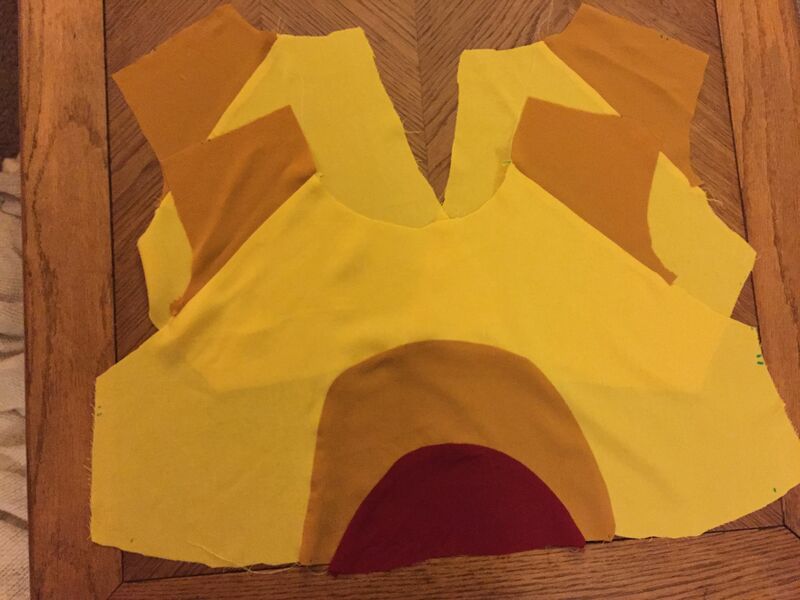 All the bodice pieces cut out. And I did! Thank goodness it worked the first time, because I definitely didn’t have enough fabric to do it over again. Here’s the bodice all put together. I pressed it better after this shot, so it’s not nearly as wonky looking in real life! Unsurprisingly, I miscalculated how much fabric I would need for all those ruffles, so I didn’t have enough to make the skirt base out of the main fabric. 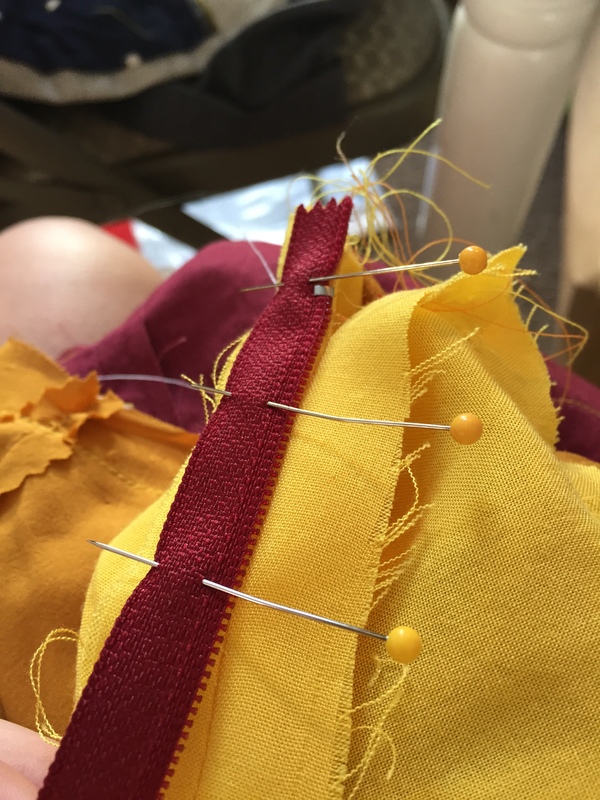 Instead, I used some maroon broadcloth that I had lying around. 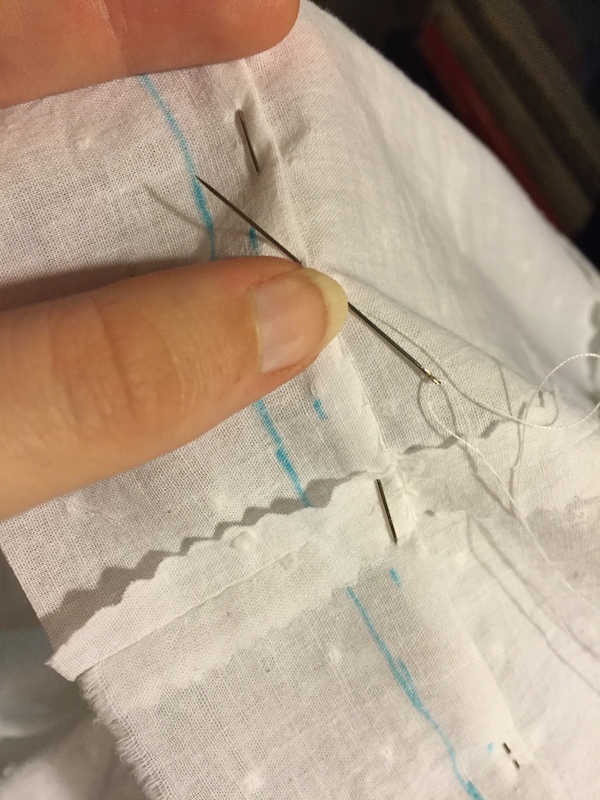 This was probably for the best, since that rayon has a bit of stretch to it, and the broadcloth provided a much more stable backing. 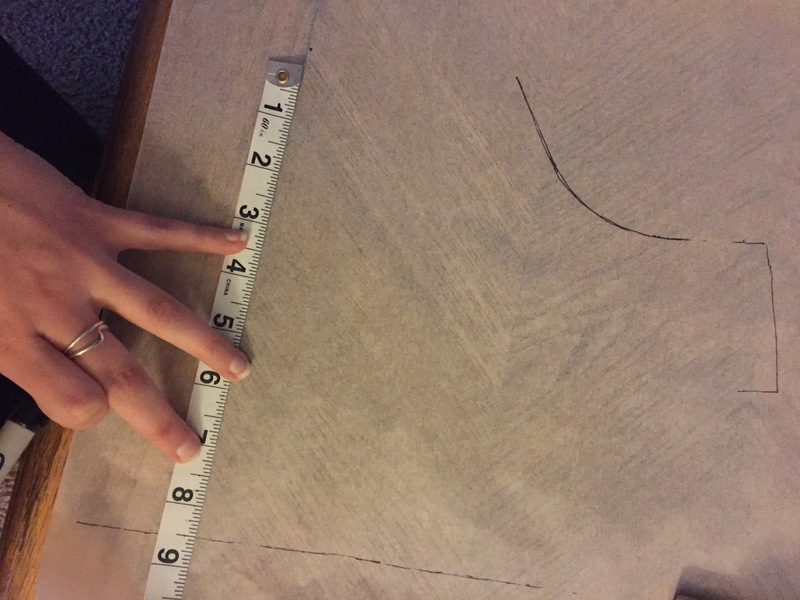 I very carefully measured and marked where each ruffle would go, because I had really limited amounts of fabric, and had to get the number and width of the ruffles right first time, or start all over again with a new fabric order. 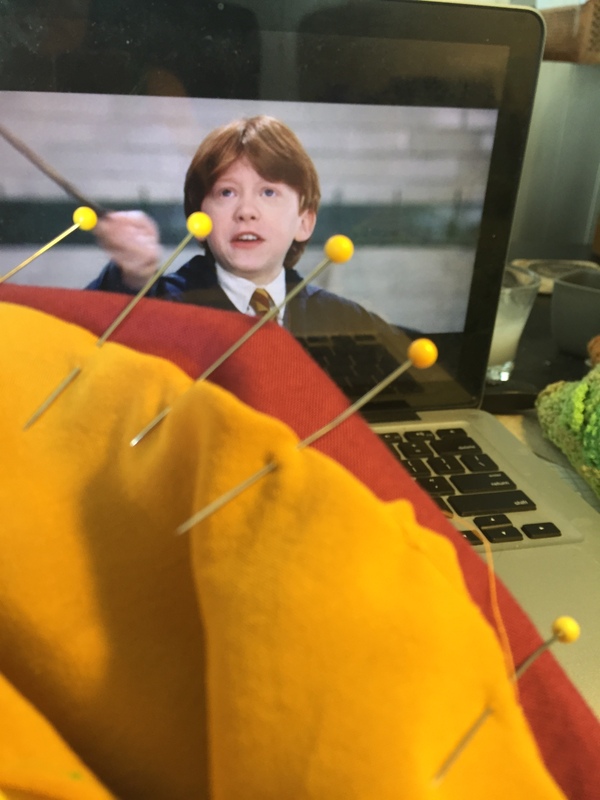 Then I set in to hem and attach all of those ruffles… Since this was Luna Lovegood, that could mean only one thing–time to watch Harry Potter!!! I attached each ruffle as I went along, since I can only do hem stitch for so long before my left hand is in agony. It took three Harry Potter movies to hem, gather, and attach all of those ruffles, including the one that goes around the neckline. 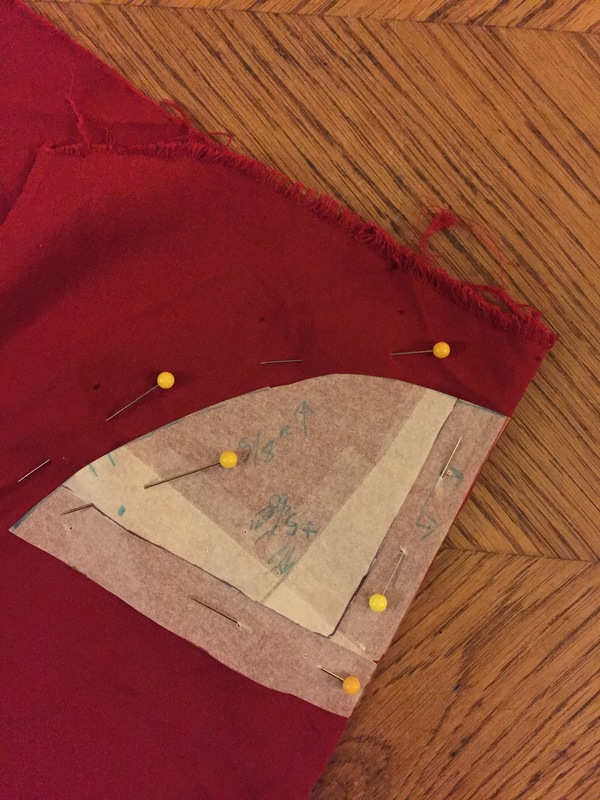 As long as I was doing all that gathering, might as well gather the bodice and skirt into that skinny little red waistband too. The dress is just pinned to the front of the dress form in the picture, because I couldn’t get it over her shoulders. Don’t worry, it fits me! 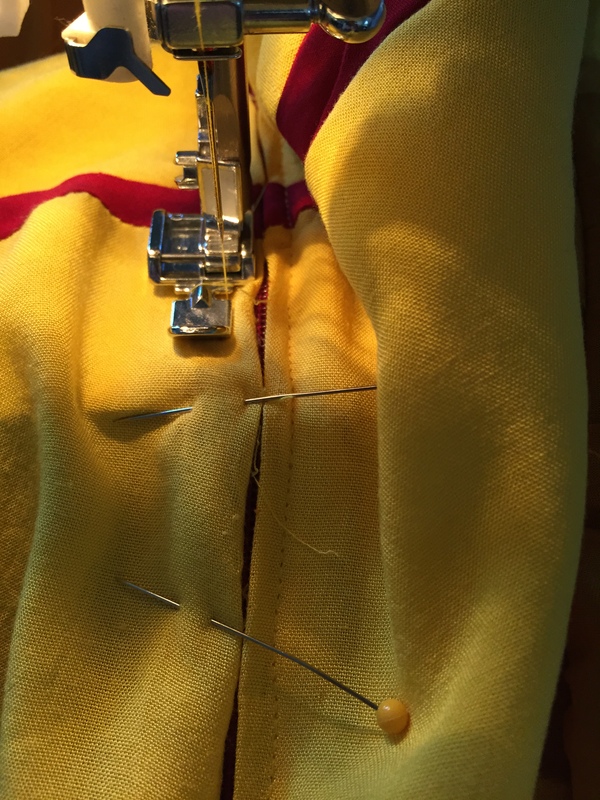 Putting in zippers is about my least favorite thing to do, but I beat this one into submission! 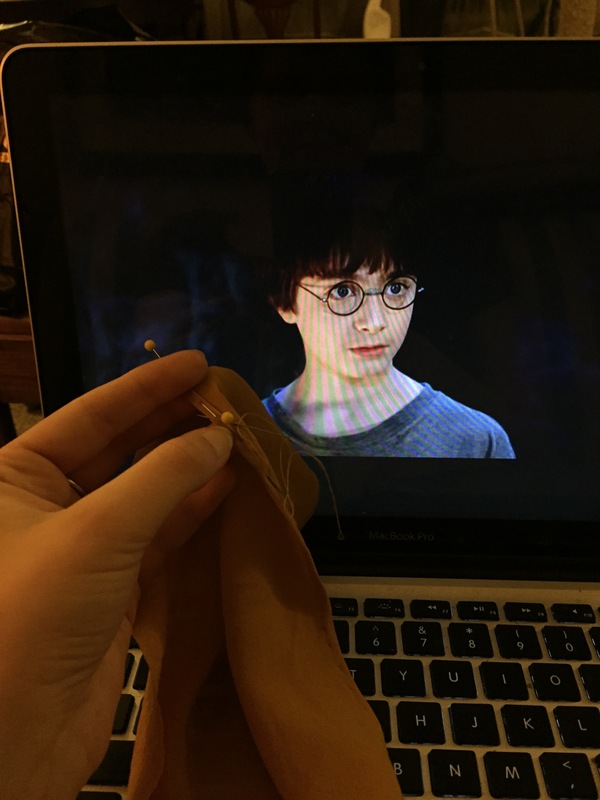 I spent Harry Potter and the Goblet of Fire stitching the lining in, and making that funny little decoration with the hanging cords, and voilà! It’s not perfect, but I think it’s a pretty good attempt, and all my complaints are pretty nit-picky. I can’t wait to see what it looks like combined with wig, shoes, wand and radish earrings! My boss’s husband is a photographer, and once I have all the accessories, we’ll do some real studio photos. Until then, beware of Nargles! Edit: Here’s a photo of me in the full getup. The wig (of course) is by Custom Wig Company. The wand is from Wizard Wands Emporium, and the earrings are from Fantastical Fun Shop, both of which are on Etsy. The gorgeous photo is by Benjamin Marcum Photography, who is an incredible portrait and headshot photographer, who also does all of the cosplay shoots for CWC. The eyebrows, unfortunately in this case, are all mine, and refuse to be covered no matter what trick I used. The only thing I have left in my idea bank is blonde mascara, but I keep forgetting to pick some up.